with regards to the opening of the Stanford athletic director’s job. Murphy played 8 seasons in the NFL with the Redskins, including a pair of Super Bowls. Murphy served as the Redskins player rep and took an active role in the strike that wiped out nearly half of the 1992 season. Murphy picked up an MBA at American University and earned a law degree from Georgetown after his playing days in the NFL ended. 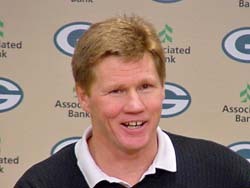 Murphy has been the Packers’ president and CEO since 2007.